We created a stunning and effective employee magazine design that was the perfect way to keep everyone informed, and engaged. “We don’t want a traditional newsletter, we want an employee magazine.” That was the brief AstraZeneca gave us following a review of their internal communications channels. Recognising the importance of internal communications and with thousands of employees in multiple sites across the UK, a stunning and effective employee magazine design was the perfect way to keep everyone informed. 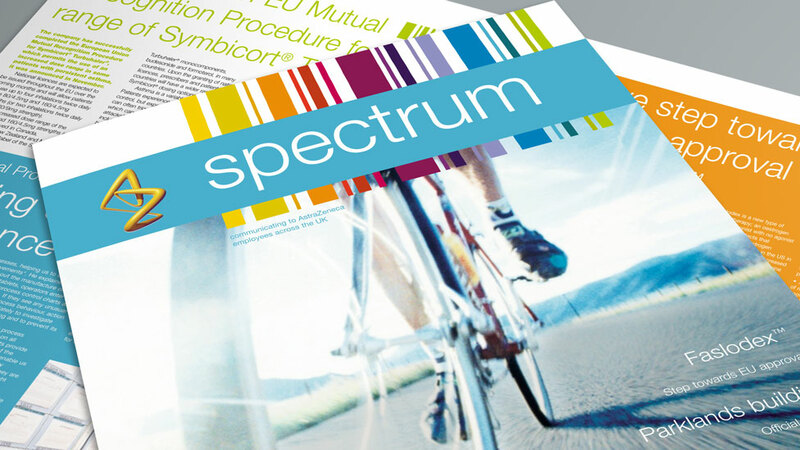 AstraZeneca had already decided on the name – ‘Spectrum’. The rest was up to us. To help achieve the most effective look and feel, we broke away from traditional A sizes and designed the magazine to a tabloid format, more evocative of a quality publication. This same feel was enhanced by choosing to print onto an uncoated matt cartridge style paper. 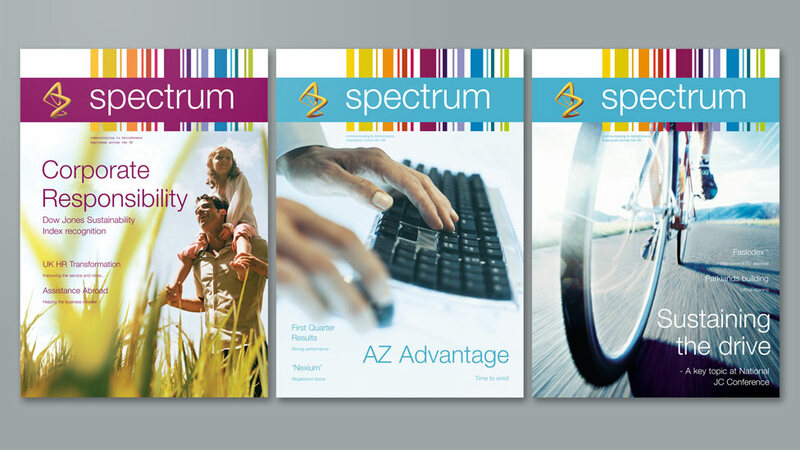 Inspired by the name ‘Spectrum’ we helped the employee magazine develop an identity of its own. Our designers took the idea of a barcode and infused it with the spectrum of colours from AstraZeneca’s brand colour palette. “Working with the Parker team is a real pleasure. For them ‘going the extra mile’ is part of the service. and work within the agreed budget, to produce a quality product. 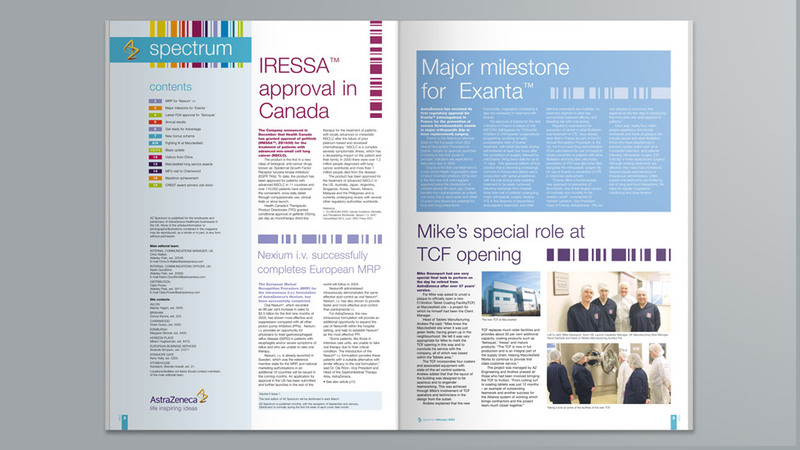 We integrated the barcode graphic throughout various page layouts within the magazine, subtly featuring on each article, adding visual continuity. Working closely with our client’s internal editing team, who provided the articles, we rewrote all the content headlines, designed and artworked the page layouts, and were also responsible for developing creative front cover concepts for each issue. 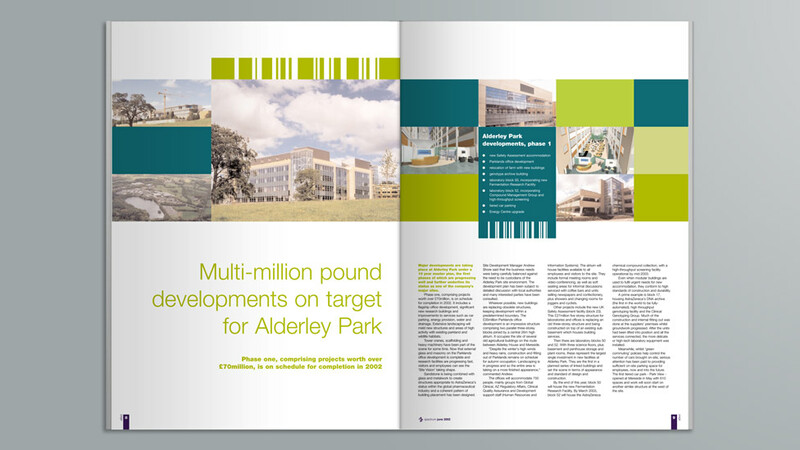 We also project managed the printing and fulfilment to ensure thousands of copies of each issue went out on time every month, direct to the homes of AstraZeneca employees. Our digital agency expertise delivered an attractive email marketing solution that helped improve employee communications and had a positive impact on employee engagement levels across AstraZeneca's North West England sites. 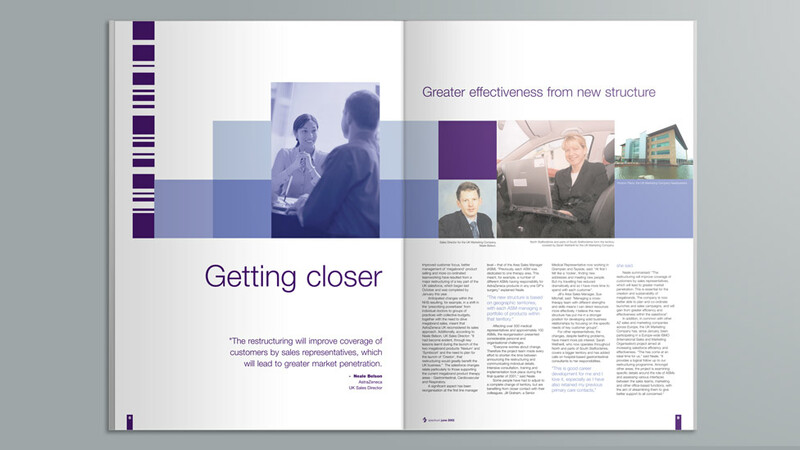 To unite senior leaders around Statoil’s strategic vision, we designed a company newsletter that would motivate, engage and develop the most promising employees. Following a rebrand and name change, Alere asked Parker Design to design a vehicle to help them launch the new brand in the UK. Wanting something more friendly and informal than a corporate brochure, our graphic design team's solution lay in an innovative newsletter design.